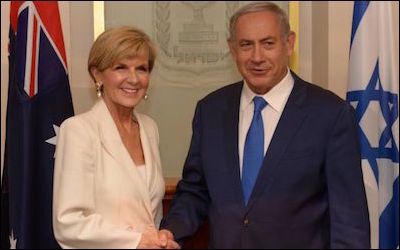 Benjamin Netanyahu, above with Australian Foreign Minister Julie Bishop, will become the first Israeli prime minister to make an official visit to Australia next year. Australia and Israel have a warm relationship. In addition to the bond of their common values, both countries well remember the important Australian military contribution to the eviction of Turkish forces from the Land of Israel in 1917, and many Israelis have fond memories of the Aussies who passed through Mandatory Palestine during WWII. The two countries also share serious strategic concerns. They should work together more closely to tackle them. In the Middle East, the Obama administration has projected weakness and encouraged Iran's quest for hegemony. The vacuum created by the lower American profile has been partially filled by the Russians, a trend with worrying implications. Asian as well as Middle Eastern states view the declining American role with concern. Despite the Obama administration's rhetoric about pivoting to Asia, it did little to reassure its allies. Indeed, many of them now fear the rise of China, which is aggressively pursuing ambitious goals. The Philippines, under the colorful President Rodrigo Duterte, appears to wish to substitute its American orientation with a Chinese one. China has been more active of late in the greater Middle East, offering support to anti-American states like Iran and Syria. The Chinese Belt and Road initiative, while primarily motivated by economics, nevertheless has strategic significance in East and West Asia. Israel & Australia share common apprehensions of U.S. retreat, a rising China, global Islamism, and nuclear proliferation. The spread of radical Islam, too, is a challenge for both Australia and Israel. In the Middle East, it is not only small radical Islamist states and groups that cause trouble. States with an Islamist agenda are contributing to the radicalization of the Muslim world. Saudi Arabia, for example, has spread its Wahhabi version of Islam for decades. Since 1979, the Islamic Republic of Iran has disseminated its revolutionary understanding of Shia, gaining control of four Arab capitals in the process – Baghdad, Beirut, Damascus, and Sana. Since 2002, Turkey has been ruled by an Islamist leader who supports Sunni radical elements in Gaza, Syria, Libya, and Iraq. Radical Islam is increasingly infiltrating South and East Asia, with the potential to destabilize countries like Malaysia and Indonesia. This prospect is of great concern to Australia, the Muslim minority of which is displaying signs of unrest. Finally, the specter of nearby nuclear proliferation is much feared by both Australia and Israel. Until recently, the Americans' traditional position as security provider was a disincentive for nuclear proliferation. The 2015 nuclear deal with Iran changed that by legitimizing Tehran's nuclear infrastructure. Egypt, Turkey, and Saudi Arabia are unlikely to stand idly by as Iran, their regional competitor, makes nuclear progress. Unfortunately, the increased mistrust of Washington's leadership has made American security guarantees less credible. A similar development is underway in East Asia, where Chinese assertiveness and the growing North Korean nuclear threat are believed to be receiving an inadequate American response. The perception of American disengagement increases the likelihood that South Korea and Japan will adopt a nuclear posture, starting a chain of proliferation in other parts of Asia. Australia's and Israel's common apprehensions about these global trends provide the strategic glue with which to build closer relations in defense and foreign affairs. With that in mind, Anthony Bergin of the Australian Strategic Policy Institute (ASPI) and I co-authored a report, The Wattle and the Olive: A New Chapter in Australia and Israel Working Together, which suggests that the two countries move towards greater cooperation. Israel and Australia have had had almost no high-level military exchanges. Up to now, there have been almost no high-level military exchanges between the two countries. Israel doesn't have a uniformed military attaché in Canberra (although it has posted a civilian from the Ministry of Defense). The Australian military attaché to Israel is based in Ankara, Turkey. A regular and sustained dialogue of foreign and defense ministers is clearly in order. A strategic interchange involving senior uniformed and civilian defense personnel should look at strategic thinking, US alliance issues, military-to-military cooperation, and defense industry cooperation. Australia should upgrade military and diplomatic relations with Israel to tap into its expertise in counter-terrorism, hi-tech weapons systems, and cyber-security. The Australian and Israeli militaries would benefit from enhanced cooperation: both operate American equipment, and both have invested heavily in world-class technology. The two militaries can share doctrinal insights and intelligence. Israel, whose military doctrine is based on self-reliance, can learn from Australia's experience in military coalitions. Israel, in turn, has experience in urban warfare and in the development of unmanned aerial systems for intelligence, surveillance, reconnaissance, and combat, an area in which the Australian air force is developing its capability. Israel also has expertise in countering improvised explosive devices (an area in which Australia also displays considerable proficiency) and is a global pacesetter in active measures for armored vehicle protection, defense against short-range rocket threats, and the use of robotics in the battlefield. 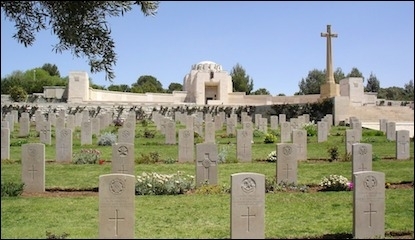 144 Australian soldiers are buried at the Jerusalem War Cemetery. Both countries are close to major choke-points along maritime oil and trade routes, making naval affairs an important component of their national strategies. Australia has a big navy and Israel plans to expand its own, in part to protect its offshore gas fields. Beyond hard security, social resilience is another area where information can be shared. Israel has managed to preserve social cohesion even when hit by terror and rocket attacks. It has endured decades of conflict, yet has still succeeded in building a flourishing economy and vibrant democracy. The two countries can also share expertise on water management. Israel is a world leader in dryland farming, drip irrigation, and waste water recycling. There is, furthermore, a clear area for cooperation in international development programs in the Asia-Pacific and Africa that support Australian foreign policy objectives. Canberra, in turn, can help Jerusalem enhance the diplomatic progress it has already made in Asia. An enhanced relationship with Israel won't damage Australia's standing in the Arab or Muslim worlds. Unfortunately, there is a tendency in Australia (and elsewhere) to see Israel purely through the lens of the Palestinian issue and the peace process. This is not the right prism. It is unlikely that an enhanced relationship with Israel would damage Australia's standing in the Arab or Muslim worlds. Israel has peace treaties with Egypt, the most important Arab state, and with Jordan. Other Arab countries are quietly getting closer to Israel because of the rise of Iran in the region and the shared fear of radical Islam. Jerusalem has very good relations with the Muslim states in Central Asia and the Caucasus. There is no evidence that Australia's relationship with Israel has in any way hindered its own defense relations with Arab countries, its defense engagement in Southeast Asia or the Pacific, its international efforts to counter terrorism and proliferation, or the ability of the Australian Defense Force to operate in Afghanistan and Iraq. Our recently issued report could serve the two countries well right now. Israel's prime minister has announced plans to visit Australia in February 2017, at which time he will seek greater cooperation. The respect ASPI and the BESA Center command in their respective countries ensures that the highest government echelons will be aware of the report. There is really no country in the Middle East whose interests are more closely aligned with Australia's than Israel. Neither state has sufficiently recognized the extent to which they contribute to one another's national interests. Australia and Israel can cooperate in strategic affairs to the benefit of both countries. The bilateral relationship could be significantly expanded. Good guys should stick together. Efraim Inbar, a professor emeritus of political studies at Bar-Ilan University, is the director of the Begin-Sadat Center for Strategic Studies and a Shillman-Ginsburg fellow at the Middle East Forum. This is an edited version of an article originally appearing at The Jerusalem Report.